Morris LED high bay I-beam design light fixture rated at 100 watts with battery backup for many types of warehouse or industrial lighting needs. Replaces a variety of metal halide and fluorescent lighting to save energy. The LED array distributes the light evenly in every direction while providing a certain amount of visual comfort, reducing glare. 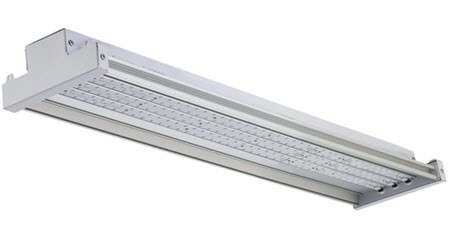 This light fixture offers quality lighting for wide-ranging applications and delivers excellent energy savings compared to linear fluorescent and HID highbay fixtures. For those of you who want to replace a 400 watt metal halide light fixture equal in a high bay or low bay situation, this might be a good way to get that accomplished. It not only has a finished look and is completely enclosed, but it also delivers it could spread of light throughout a space that you may be using it in. That makes a great for almost any area you may have more spaces are little bit tighter and you might be doing some kind of 1 for 1 replacement of a higher wattage HID light fixture. It has better efficiency than some of the first generation of LED light fixtures having its efficacy at 145 lumens/watt. Because it has a 50,000 hour life expectancy, you will get many years of reliable service and excellent light output during that time. There's also a five year warranty so you don't have to worry about early failure on this light fixture, we've got you covered. It's perfect for almost any industrial situation or commercial lighting, but there are any number of applications that could use and LED type of light with this small package. - Replaces 400 watt metal halide.